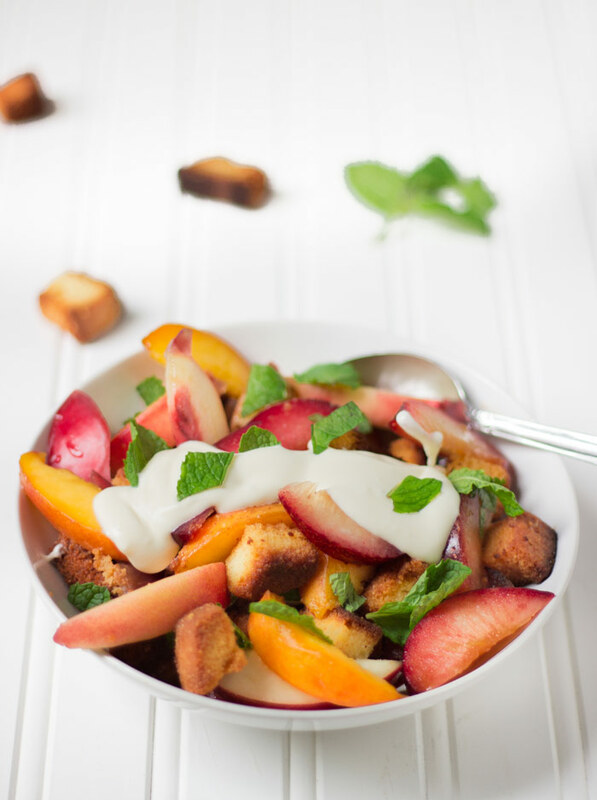 This stone fruit panzanella is a recipe that I’ve been meaning to post for quite a while now…as in several years. I originally read about it an issue of Food & Wine when San Francisco chef Chris Cosentino shared his version, and was immediately intrigued. Panzanella, for dessert? Panzanella is one of the dishes I most look forward to making when late summer rolls around, mainly because it’s my favorite way to enjoy juicy heirloom tomatoes and crisp cucumbers. Tossed with a simple dressing and toasted leftover bread cubes, it’s hard to believe that, at one point, this was peasant food. This version, however, is anything but peasant-ly. Instead of using cubed sourdough like Chef Cosentino, I baked a pound cake using this recipe from Brown Eyed Baker (it truly is perfection), then cubed and toasted it to make pound cake “croutons.” The best part of this dish is that even though I made my pound cake from scratch, you can easily take the help of the grocery store and just use a store-bought one from the bakery. Cut it up, let it sit overnight to dry out (otherwise your croutons will fall apart), then toss the cubes with melted butter and toast them in the oven until crispy on the outside and still tender on the inside. Instead of creating a separate “dressing,” just let the natural juices in the stone fruit do the work for you. You can use whatever mixture of fruits you prefer, but I like a balance of soft yellow peaches, fresh white nectarines, and lightly crisp plums for a balance of texture, flavor, and color. 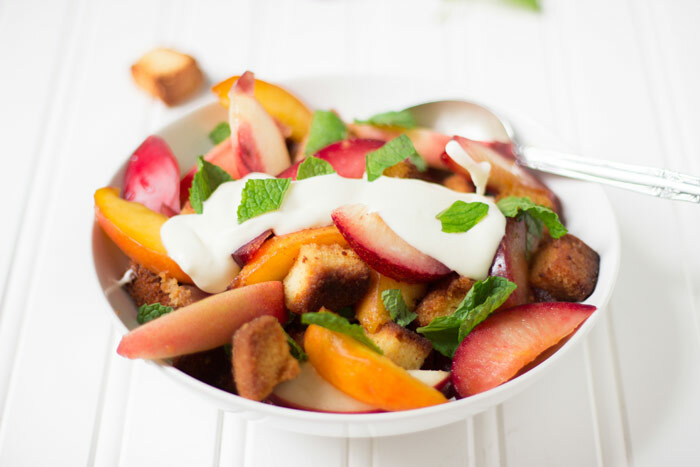 When you toss the fruit with sugar and a splash of orange juice, they macerate, releasing their natural juices and creating a built-in “dressing.” To give the panzanella more depth, I added a few drops of vanilla extract to the fruit as well. Toss it all together with a handful of fresh mint and serve immediately topped with sweetened vanilla-scented creme fraiche. To prevent the pound cake from getting soggy, my recommendation is to make the fruit mixture ahead of time, make the croutons ahead of time, and just toss it together right before serving. That way, with each bite you’ll get the crunch of the croutons and the freshness of the fruit. It’s elegant, simple, and absolutely beautiful to look at! (Note: it’s even better to eat). The night before, cut the pound cake into crouton-sized cubes and spread out on a baking sheet. Allow to sit out overnight, uncovered, to dry out. To make the pound cake croutons, preheat the oven to 350 degrees F. Toss the dried, cubed pound cake with 2 tablespoons of melted butter and spread on a baking sheet. Bake for 10-15 minutes or until golden brown and lightly crunchy, stirring once. Remove and allow to cool completely. In a large bowl, toss the sliced stone fruit with 1/4 cup of sugar (or slightly more depending on how sweet the fruit is), orange juice, and 1/2 teaspoon of vanilla extract. Set aside for 15 minutes to allow the fruit to macerate. In a small bowl, mix the creme fraiche with 1 teaspoon of sugar and 1 teaspoon of vanilla extract. Taste and, if needed, add a touch more sugar. By now, the fruit mixture should have released some liquid, which will become the dressing for your panzanella. 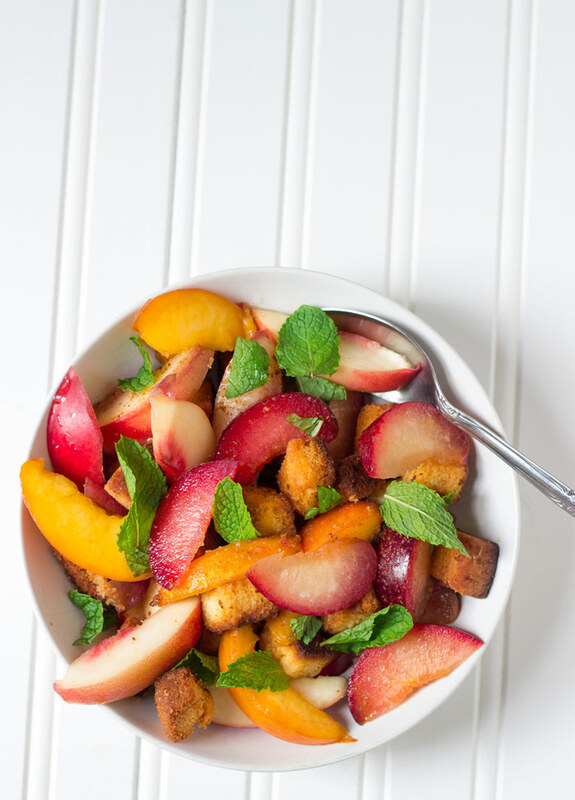 In a large bowl, combine the croutons, fruit mixture with liquid, and fresh mint. Toss to combine and serve immediately with a dollop of vanilla creme fraiche.